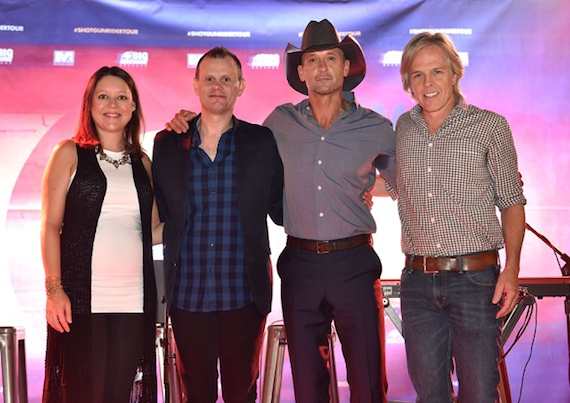 Pictured (L-R): Hillary Lindsey, Troy Verges, Tim McGraw and Marv Green. Bobby Karl does not usually work No. 1 parties, but he made an exception on Saturday night (8/15). There were several reasons for this. First of all, this party was for the enduringly great Tim McGraw. Second of all, the invitation came with tickets for his Bridgestone Arena concert. Third, “Shotgun Rider” was the title of his tour and a No. 1 smash for four weeks. “Do you know how hard it is to get four weeks at No. 1? !” Scott Borchetta asked the crowd. “It takes all of us for this to happen.” That meant the assembled publishers, songwriters, musicians, radio friends and media mavens, not to mention Jack Purcell and his amazing Big Machime promo squad. This is the equally amazing Tim McGraw’s 36th No. 1 hit. He has sold 40 million records so far. By any measure, this has been an especially noteworthy year for McGraw. He began it by singing “I’m Not Gonna Miss You” for Glen Campbell at the Oscars. He was named one of Time magazine’s 100 most influential people (only one of two recording stars on the list). He is set to have The Shack as his next movie, co-starring with Sam Worthington, Octavia Spencer and Graham Greene. He has given away 120 homes to returning veterans. 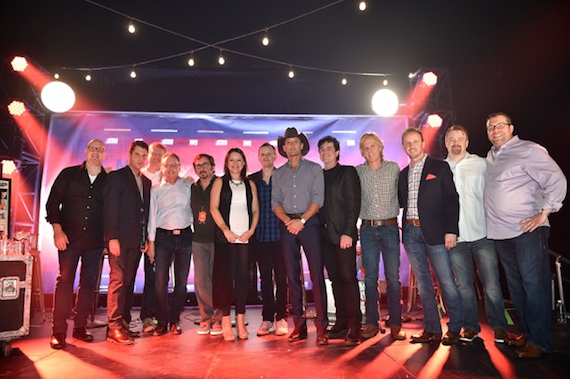 Tim McGraw (center) celebrates “Shotgun Rider” with songwriters and industry members. In this instance, the lucky songwriters were Marv Green, Troy Verges and Hillary Lindsey, all of whom took the mic to express their gratitude. 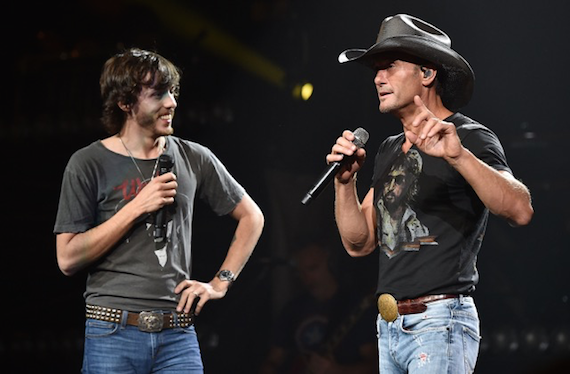 “Shotgun Rider” is Green’s seventh No. 1 single, Verges’s eighth and Lindsay’s 13th. She had another chart-toppiing phenom this year with “Girl Crush,” by the way. The event was staged in the cavernous rehearsal hall of the Bridgestone. The backstage stage was bathed in glowing lights and atmospheric smoke. Faux food trucks were set up serving street tacos, grilled-cheese mini sandwiches and popsickles. There was a photo booth and a lip-sync video challenge in McGraw’s jeep. An army of wait staff circulated constantly. Lounging couches and cocktail tables were scattered throughout the space. It was all quite nice. “I’ve been to a lot of No. 1 parties, and I’ve never been to one this nice in my life,” said Williams. Craig Wiseman, Craig Hayes & Pam Brown Hayes, Mark Collie, Mark Brown, Mike Sistad, Michael Martin, Rod Essig, Rob Simbeck, Bob Paxman, Ben Vaughn, B.J. Hill, Kent Earls and Byron Gallimore worked the room like pros. So did such celebrants as Pete Fisher, Storme Warren, Steve Bogard, Scott Siman, Charlie Cook, Lance Miller, Gillie Crowder, Lon Helton, The Community Foundation’s Ellen Lehman, Barry Coburn, Brian Mansfield, Karen Tallier, Phyllis Stark, Rusty Jones, John Zarling, Will Byrd, Jimmy Carter, Todd Cassetty, Cindy Watts and Jeff Gregg. There’s a No. 1 party in Nashville every week. But this one was something special, for a very special star. After all, Tim McGraw first made the charts in 1992, scored his first No. 1 hit in 1994 and has placed about 80 titles on the charts to date. They don’t make many with that kind of staying power. Except maybe the party boy, himself. As you might have noticed, this is the 500th BKWTR column. The best party? I like to think that it is still to come. 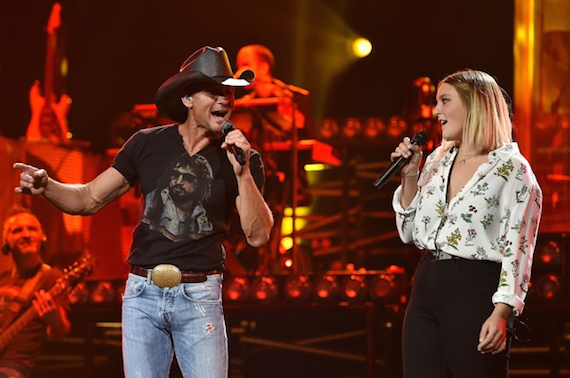 Tim McGraw performs with daughter Gracie.